While some vehicles rely on cameras for cruise control information, the 2019 Toyota Tacoma goes a step farther with its proprietary Dynamic Radar Cruise Control (DRCC) safety system. DRCC works with the assistance of a front-end mounted guidance radar system that works in tandem with an optical system to accurately predict object distance. The 2019 Toyota Tacoma DRCC system can also slow down or speed up the car independently of driver control. 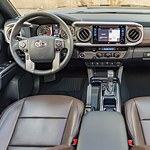 In addition to the near autonomous radar guidance system, the 2019 Toyota Tacoma also takes over many light switching functions. This bold and popular vehicle includes Toyotas Automatic High Beams (AHB) service. The Toyota AHB system engages light-sensitive cameras when the vehicle is moving faster than 25 mph. These cameras can sense the intensity of oncoming headlights and automatically dim the Tacoma headlights in response. This system both allows for increased driver awareness as well as increased oncoming driver visual acuity.